The Iran Protests: A Third Path to Political Change? Here, Alizadeh suggests that the long term stability of the IRI state is the prerequisite for the growth of democracy inside Iran, given that the many international and civil wars plaguing the region have imperilled the prospects of long term security and democracy in countries such as Iraq, Syria and Libya. Over the years, reformist, postcolonial and conservative commentators have employed narratives similar to Alizadeh’s as a key reason for supporting the Iranian reformist movement. Offering itself as the only viable alternative for political change in Iran that does not jeopardize the safety and stability of the Iranian people and state, the Iranian reformist movement has largely deployed Alizadeh’s narrative toward establishing hegemony over articulations and mobilizations of dissent inside Iran. The reformists claim that concrete political change inside Iran, and any transfer of power from the conservative faction of power spearheaded by Ayatollah Khamenei to the Iranian people, is possible only via their gradualist and revisionist agenda. The coextensivity of internal security and regional stability for the IRI is, however, erased in Alizadeh’s analysis. In reality, the signature strategy of the IRI’s foreign policy is to mobilize the exigencies of policing the Middle East region as a means of policing dissent inside Iran: as long as the Middle East is unstable and the IRI must take an active part in securing its interests all over the region, all political projects for change inside Iran must take a backseat to the contingencies of national security. Since 1979, the IRI has had to contend equally with the possibility of subversion from both inside and outside Iran. Therefore, and without reducing the role of international and regional players such as the United States, Russia and Saudi Arabia in destabilizing the Middle East, it is necessary to foreground how the reformist disavowal of the strategic relation between Iranian regional and internal security (which Alizadeh here articulates for the mass media) only works to erase the role of IRI as a neoliberal state and expansionist force in the Middle East region. On one hand, this reformist erasure promotes a reductive dichotomy between the Iranian state and international threats to its regional hegemony. On the other, it establishes an anti-democratic antagonism between the Iranian state and grassroots movements for radical change inside Iran. Alizadeh and others employ this erasure to suggest that the new round of protests in Iran only advances the agendas of IRI hardliners and Washington neoconservatives, because any form of dissent that projects itself outside the accepted avenues of reformism ultimately undermines President Hassan Rouhani’s reformist-backed presidency. Evidently, this reformist narrative also overrides the agency of subaltern classes to present an alternative to the Iranian middle class’s reformist agenda, a strategic and tactical platform that has delivered little in plans and promises in the 22 years of its hegemony over the discourse of political dissent in Iran. The new round of protests offers an alternative path for political change inside Iran. The most defining characteristic of this new movement is its differences, in both form and demands, from the majority middle-class, reformist movements that have appeared in recent years. From the Green Movement to the many online and electoral campaigns that promote a mainly liberal agenda, the reformist protests of the past evolved from and revolved around liberal economic and political demands, with an emphasis on nonviolence as a tactic of political dissent. But the new protest movement is not only primarily working class, with demands centered around social and economic justice, but also more defiant, less conciliatory in tone, and equipped with a strongly anti-establishment array of slogans. Importantly, the new protest movement’s calls for an alternative to the options tabled by the reformist/conservative status quo harbours a transformative potential for a third, and more effective, movement for political change in Iran. Its transformative character is evident, first and foremost, in its unwillingness to confine its political options to the political gradations and horizons fixed by the IRI state: these protesters chant, “Conservatives, Reformists, One Way or Another / It’s All Over!”. Antonio Gramsci famously remarks that “appearances are historical necessities.” We contend that the new protest movement’s anti-establishment counternarratives should be interpreted as such “necessary” expressions of a deep divide and disconnect between the Iranian working and middle class movements. These new slogans are making all Iranians inescapably aware of deep socioeconomic contradictions within their ranks. 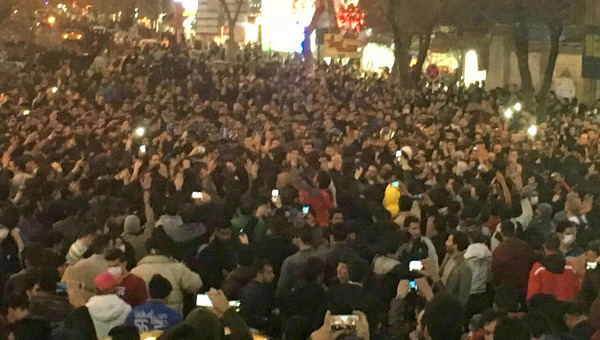 No matter the outcome of these protests, the Iranian reformists can no longer claim to represent the political interests and aspirations of all Iranians. If the growing debate over a “third path” of “transition” from reformism which presently occupies Iranian statesmen, analysts and observers is essentially a concern with the implications of the new protest movement’s political counternarrative, it is because neither the reformist nor the conservative factions of power in Iran can possibly offer a long-term solution to the unequal labour conditions and subsistence issues and demands of the Iranian working class. The Iranian economy is structurally incapable of catering to these demands in the long run, and the neoliberal exigencies of Iran’s transition to the global markets will only exacerbate the shortcomings that plague the lives of Iranian subaltern classes. The IRI has historically confined the limits of the language of political dissent and organization inside Iran to a choice between its own conservative and reformist/centrist political factions. And, despite internecine power struggles between these two factions, which have on occasion led them to conflicts as serious as the contentions over the results of the 2009 elections, in practice and overall strategy these two groups have historically functioned as a unified clique of power. This clique has ruled Iran since the 1979 revolution and upholds a tacit, but inviolable, inter-factional agreement regarding the “principles of the IRI state” (Ayatollah Khamenei’s favorite terminology). The ruling IRI clique consolidated its hold over power in the post-revolutionary 1980s by way of eliminating all left, liberal, secular and “Islamist-socialist” (Mujahedin-e Khalq) parties that participated in the 1979 revolution. In 1992, the leaders of Iran’s Kurdish Democratic Party were assassinated in Berlin, and by the time the Serial Killings of Iranian intellectuals were carried out in 1998 all domestic alternatives to the rule of the IRI clique had been exterminated from the post-revolutionary political stage. This ‘wage war and rule’ strategy would later set the template for the current hegemonic “national security” discourse, which justifies political oppression inside Iran in the name of securing the strategic “Shi’ite Crescent” that extends from Iran to Israel through Northern Iraq and central-southern Syria. If the strategic import of the state of Israel to securing the perimeters of American foreign policy in the Middle East region is indubitable, it is necessary to emphasize – in contrast to all reductionist definitions of Iran’s “national security” – that pursuing an Iranian foreign policy agenda based on transnational Shi’ite solidarity is shrewdly coextensive with securing the domestic hegemony of a state ruled by pretensions to Shi’ite jurisprudence. Thus, it is insidious to argue that the IRI pursuit of regional and international interests does not necessarily activate the same exigencies internally. Rather than constituting a mere precondition for ensuring national security, this foreign policy agenda also enables the IRI to maintain its internal hegemony. The post Iran-Iraq war era imposed its own imperatives on the IRI’s economic agenda. Having already nationalized and monopolized revenues from big industries such as oil, and confiscated the assets of the capitalist class loyal to the Pahlavi regime in the immediate years after 1979, the IRI clique managed to significantly “bridge” the class divides that it had inherited from the Pahlavi era throughout the early and mid-1980s. Nevertheless, the high costs of the protracted war campaign and the need to rebuild the state and country after the war were simultaneous to the devastating 1980s oil glut and the drop in the global demand for energy. The loss in oil revenues, coupled with Khomeini’s sudden death, served to intensify the conflict between two competing interpretations of the IRI’s foundations and its future: the centrist-conservative faction led by the then-president Khamenei and speaker of parliament, Hashemi Rafsanjani, who advanced the cause of the structural adjustment programs of the IMF and the World Bank; and the left-Islamist (now reformist) faction led by figures including the Prime Minister Mir Hossein Mousavi, who instead promoted a statist program of economic reform and rejuvenation. In this conflict, the latter camp was ultimately sidelined from power, and the neoliberal phase of the IRI’s existence was inaugurated. Significantly, the privatization and deregulation policies carried out under this neoliberal economic regime favoured the economic interests of the ruling power clique and its affiliates, with the Iranian Revolutionary Guard Corps (IRGC), which had found its way to political and strategic decision-making power during the Iran-Iraq war, as a primary beneficiary. This change of fortunes would transform the IRGC into a powerbroker of the Iranian economic, military and political spheres over the following decade. Nonetheless, the conservative faction’s economic reform program – officially dubbed “The Reconstruction Era” – was essentially only a continuation of the Pahlavi regime’s own development program, one that favoured the expansion of industry and services to the urban metropolises at the expense of under-developing the peripheries and margins of Iranian urban geography. Consequently, the neoliberal version of the Pahlavi economic agenda pursued by the IRI during the 1980s and 90s produced the same results as in its earlier political incarnation under the Shah: it bloated the urban middle class at the expense of the working and marginalized classes. “The Reconstruction Era” led the country’s economy to such a degree of inflation and recession that a first round of working-class revolts erupted in 1992 from the urban and economic peripheries. This first round of working-class revolts, coupled with the legitimacy crisis provoked by the Mykonos court’s revelations and the pressure of Bill Clinton’s “D’Amato” round of economic sanctions, forced the conservative faction of the IRI to reinvite the sidelined reformist faction to a power sharing project aimed at restoring the legitimacy of the IRI state. This feat was accomplished with a landslide vote in the 1997 elections, when Iranians appointed Mohammad Khatami – deemed the “Chief of Reform” – to the office of the president. But this time around, the reformists were only loyal to the neoliberal economic agenda of the ruling IRI clique. And even though the reformist government did allow for controlled expression of criticism within liberal media and culture, the conservative faction remained in firm control of key state institutions such as the Judiciary, the Guardian Council, the IRGC and, most importantly, the office of the Supreme Leader. As a result, Khatami and his reformist faction managed little in the way of critical reforms during their two terms in the president’s office; they rarely challenged the conservative faction’s monopoly over state power, and even gradually lost ground on the media and cultural reforms that they had initially implemented. The critical shortcomings of the “Reformist Government” of Mohammad Khatami alienated core demographics of its support base, and particularly its middle-class power base. In the absence of middle-class support, the conservative hardliner Mahmoud Ahmadinejad rode a populist wave of working-class dissatisfaction with the reformists’ prolongation of the IRI’s neoliberal economic agenda to surpass the reformist candidates in the first round of the 2005 elections. In the second round, a strong “no” vote cast by the working class against Hashemi Rafsanjani (the reformists’ coalition partner at the time) in favour of Ahmadinejad, returned the control of the president’s office to the conservative faction. Proving more strategic in his economic plans for the subaltern classes, Ahmadinejad implemented popular subsidiary, housing and loan policies backed by a sudden upsurge of oil prices in the international markets. Nonetheless, it was ultimately Ahmadinejad’s notorious “surgical” cuts to many essential subsidies that inaugurated a new era of austerity politics in Iran, culminating, initially, in the rise and subsequent crackdown of the working-class “Bread Revolts.” Ahmadinejad’s two terms in office were also simultaneous with the inauguration of a notorious era of economic profligacy, corruption and consolidation of capital by the IRI clique, and in particular by the IRGC military-industrial complex, which took advantage of Ahmadinejad’s popular mandate to extend its influence to every significant economic and political institution of the IRI. Despite mass discontent with the IRI’s state apparatuses in the aftermath of revelations about the violent crackdown on Green Movement protesters, in 2013 the Iranian middle class once again voted for the reformist-backed candidate, Hassan Rouhani. 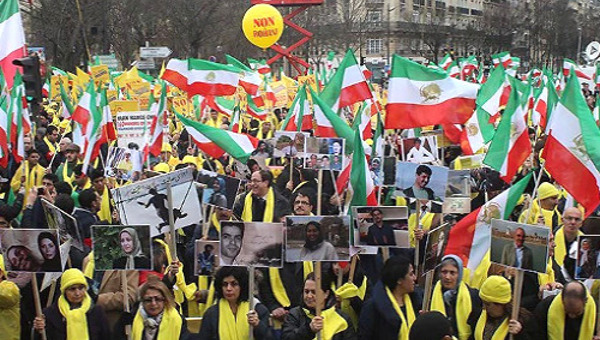 This time, it was the crippling and isolating effects of the Obama round of sanctions against Iran’s nuclear program, and the plummeting oil prices resulting from Saudi Arabia’s increased production, which sent the Iranian demos back to the voting booth. As for the IRI hierarchy, they were already negotiating the foundations of the 2015 nuclear deal (Joint Comprehensive Plan of Action) in secret via Omani mediation, and appointed Rouhani – Iran’s chief negotiator during the initial round of nuclear talks in 2003 – as the candidate to bridge a consensus over the seemingly irreconcilable divide between the IRI state and the Iranian nation. This domestic media campaign was twinned with a foreign policy strategy that ultimately forced America’s hand during the nuclear negotiations. Obama’s “Shift to the Pacific”, the decisive interventions in Syria and Crimea by Russia, Iran’s ally, the rise of ISIS, an ineffective U.S. foreign policy in Iraq and the Gulf states (which had handed Iraq over to Iranian control and spread IRI influence in the mainly Shi’ite nations of Bahrain and Yemen) and finally the upheavals of the Arab Spring movements in northern Africa, had altogether destabilized the established balance of power in the Middle East and jeopardized American control over strategic waterways in the Black, Mediterranean, Oman and Red Seas that were essential to the movements of its navy and the flow of oil to international markets. Throughout this strategic shift, Iran’s unilateral support for the Assad government in the form of intelligence and policing aid had led an initially peaceful Syrian protest movement down the path of the current civil war. The IRI tactics went even so far as transferring Al-Qaeda leaders held captive in Iran to Syria, all in order to “radicalize” the protest movement and justify Assad’s crackdown against Syrian opposition. The IRI therefore kept the Shi’ite crescent intact by maintaining its vital and threatening access to Israel via Lebanon’s Hezbollah; Assad-controlled regions of Syria; and, during Iraq’s civil war, to Baghdad-controlled areas of Iraq. Moreover, the IRI’s orchestrations in Syria helped nurture the violent spectre of ISIS as a formidable straw man with which to frighten the residents of both the Middle East and the West into cynicism and submission – a feat accomplished only with the help of other regional powers that pursued their own political ends in Syria, as well as, critically, the regional and global backlash against a violent history of Western imperialism in the region. The stark ‘success’ of the IRI’s strategy affirmed the status of Iran as an “island of stability in the region” (Alizadeh’s popular reappropriation of Carter’s terminology) and rallied popular support for its “national security” campaign, forcing the U.S. government into a tactical checkmate: having already conceded part of its control over the Middle East, the Americans now had to resign themselves to the new status of Iran as a legitimate nation-state and unacknowledged regional partner. The 2015 Joint Comprehensive Plan of Action soon followed, because the continuation of the Iran – USA dynamic of hostilities was no longer plausible in its traditional forms and rhetoric. Having effectively set its strategic depth and borders outside Iran and across state lines in the region, not only had the IRI secured its bargaining rights over the nuclear deal and pushed back against U.S. sanctions, but it also appeared for a time (prior to the new round of protests) that the IRI had finally established and consolidated itself as the legitimate, rightful representative of the Iranian people. With the success of Iran’s regional project, it was also inevitable that the likes of the security discourse expressed by Alizadeh would be utilized by the IRI regime and its reformist intellectuals as a tactical and ideological measure against those expressions of dissent inside Iran that threaten the IRI hierarchy and the ‘stability’ this regime provides for Iranians through its policing of the Middle East region. In this hegemonic security discourse, the reformists are then framed as the “rational” and “moderate” faction of Iranian politics that can secure both the IRI’s regional and international ambitions, without risking the economic and political costs incurred by hardliners such as Ahmadinejad. Naturally, Iran’s renewed access to global markets secured through the nuclear deal could only materialize through further deregulation and neoliberalization of the labour and finance markets inside the country. A welcome prospect for many middle class Iranians who sought renewed ties to the West after years of international isolation, Rouhani’s campaign promises to rejuvenate the post-sanction Iranian economy and its international image – such as lowering the inflation rate to “below 25%,” raising the “minimum wage,” and “improving bilateral ties” with regional actors such as Saudi Arabia – secured him a second term in office in 2017. But, having already weathered the storms of the nuclear sanctions and the wars in the Middle East, the two factions of the IRI’s ruling clique waged a vicious election campaign against each other prior to Rouhani’s landslide win. With a bounty of new economic deals with Europe and the rest of the world at stake in this runoff, the reformists and conservatives aired each other’s dirty laundry during presidential debates live-streamed on Iranian State TV, exposing the Iranian public to a disillusioning array of scandalous, corrupt and nepotistic practices by both sides. Last month, in order to justify cutting subsidies on foodstuff and petrol, Rouhani’s team leaked an overlooked component of his government’s budget. Yet, the leak backfired: the list of offices, institutions and religious, military and paramilitary persons and organizations connected to the office of the Supreme Leader and the IRGC – all of whom pocket a large segment of Iran’s annual budget – provoked a wide wave of popular discontent with the direction and policies of his government (and the IRI as whole) that swept the print and online media landscape. The timing of this leak was critical to the events that followed: over the course of the months leading up to the new protest movement in Iran, close to a thousand protests and strikes had been staged all over the country by various labour and retiree unions who were disenfranchised by the economic policies of the Rouhani government, as well as by ordinary citizens who had lost their life savings to fraudulent or bankrupt financial institutions. The climate of domestic public opinion about the IRI was ripe for an abrupt shift. Retaliating against Rouhani’s targeted leak, a hardline cleric connected to the conservative factions reportedly staged a protest in the city of Mashhad to underline Rouhani’s poor track record with the poor, and further undermine the reformists’ flagging reputation with the subaltern classes. 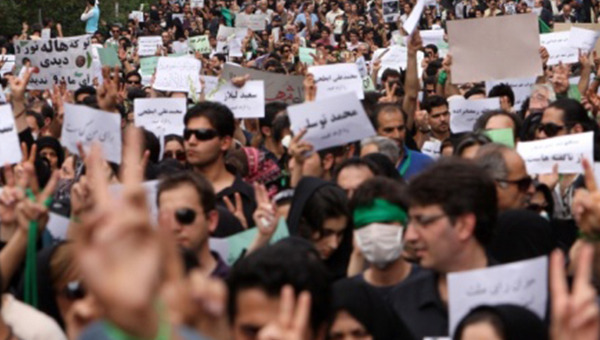 Staged against a background of dissatisfaction and impatience with the slow pace of economic recovery after the lifting of U.S. sanctions – an expectation formed by IRI’s own propaganda during the nuclear negotiations – the events in Mashhad quickly triggered rounds of working class protests all over Iran that lasted several days and spread to more than 90 cities. 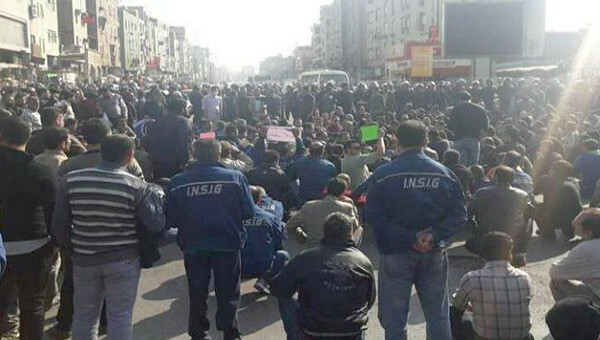 As expected, protests were carried out in the margins and cities peripheral to Iranian urban centres, and their central rallying cry of “Bread, Work, Freedom!” has translated marginalized Iranians’ economic concerns into an emergent political program. Interestingly, when these protesters vandalized public and private property, their targets consisted of venues which were symbolic of the IRI’s state power, such as patrols of Basij (an IRGC-affiliated paramilitary organization), and banks and offices of the Supreme Leader’s clerical representatives in their cities. Access to Instagram and Telegram are now permanently blocked, the latter of which is the most popular social media platform among Iranians. Telegram harboured the notorious channel that reportedly kick-started the social media campaign of the protests, before it was shut down by the company in response to an official request from Iran’s Minister of Information Communication and Technology. What is more, it seems that the IRI has taken note of the protesters’ demands and is working to ‘alleviate’ their discontent by implementing measures such as barring the forecasted rise in the price of bread and other items. In a live interview with Vahid Yaminpour, an Iranian state TV host and IRGC affiliate, Alizadeh spoke from London, England, firstly to stress the need to recognize and “manage” the legitimate anti-corruption demands of the working class, only to then suggest that the radical and anti-establishment overtones and slogans of this movement had to be repressed, for “any riot” in England or the U.S. deserves this fate. Echoing this mindset, some leftist, postcolonial and pro-reformist Iranian academics inside and outside Iran have equally undermined the new protest movement by reducing its political demands to “diffuse” expressions of ideological or purely economic “grievances.” Critically, these commentators erase these protesters’ deep consciousness of their treatment by the IRI, a long history from which their new movement draws its radical aspirations. Marxist and postcolonial commentators on Iranian politics should instead focus on countering the right wing and orientalist narratives offered by Western policymakers and the mass media, without overlooking the many critical nuances of political developments inside Iran. In overemphasizing the role of the United States and other global actors in shaping the economic hardships endured by Iranians – which also underestimates the aforementioned histories of the plundering and brutalizing of the Iranian subaltern classes by the Iranian ruling clique – these leftist, postcolonial and reformist commentators risk complicity in reproducing the very conditions of suffering denounced by Iranian protesters. Reformist commentators may very well argue that it is the heavy presence of anti-riot forces and machinery in the capital and major urban centers, and the recent painful memory of the Green Movement crackdown, which has prevented the middle class from joining their fellow working class Iranians. They also highlight how the heavy presence of the IRI task force in the center has left its disciplinary organs in the peripheries thin and under-equipped, thus allowing the new working class movement to fill the power void. But regardless of how the Iranian middle classes choose to heed the chants of their fellow working class Iranians – “Don’t just observe us from up there/ Come and join us down here!” – the Iranian people as a whole know well enough that the radical economic and political character of the recent protests is rooted mainly in the long-standing and cumulative discontent of subaltern classes from the margins, and that their anger is the expression of a deep dissatisfaction with the entirety of the ruling clique and its capitalist, authoritarian and expansionist rule over many years. The political aspirations behind the economic slogans of the new protest movement are directed at the IRI’s economic corruption and political repression. However, outside the heavily moderated presidential elections and the choice between reformists and conservatives, there are no other established venues for democratic dissent within the Iranian political space. Neither will the IRI tolerate any political education and organization outside the reach of its own state apparatus, leaving the Iranian working class with a lacking, or poorly-equipped, language of dissent. The question of transition from reformism must therefore contend with three future possibilities. The first two of these will not bring these groups any nearer to their aims and demands, namely, the possibility that the new protest movement may fall prey to the populist promises and plans of the likes of Ahmadinejad once more, or that the classes behind this movement may hold other rounds of protests in the future, only to risk even more arrests and killings. But there is also a third possibility, that of transforming the new protest movement’s class consciousness into a radical platform for political change in Iran. The stakes for such a practice are high, and the strategic field for its implementation is mined with danger, but the tactics of Dual Power and Democratic Confederalism are proven possibilities in the Middle Eastern political scene and could very well form the strategy for this radical political transition. An earlier version of this article first appeared on New Socialist website. Although the slogans of this movement do, in many instances, openly call for “regime change,” we will show that these subversive chants for the overthrow of the clerical hierarchy, as well as the songs which refuse the proffered choice of the reformist/conservative dyad, are different in demands and aspirations from similar expressions found in the political language of exiled opposition and monarchist groups. Needless to say, the IRI’s clique’s costly support of Ahmadinejad’s hawkish politics, and its increasing belief in the necessity of acquiring nuclear technology as a matter of national security, were directly correlated with the presence of American forces around Iranian borders in the post 9/11 era. For example, the ban against medicine – one of the most unpopular items on the U.S. sanctions list – was not on the U.S. Treasury’s official list of sanctions against Iran. Controversial revelations by Marzieh Vahid Dastjerdi, Ahmadinejad’s health minister, regarding the IRGC’s ‘mismanagement‘ of funds earmarked for medicinal supplies from abroad, were followed (after her removal) by Seyed Hassan Ghazizadeh Hashemi’s concession that “The medicine problem is caused by ourselves, it is not related to sanctions at all.” The Iranian public had been led to believe that the drug shortages were mainly due to the U.S. sanctions. In fact, this campaign was so comprehensive and effective in manipulating public opinion in Iran that the results of a controversial 2016 survey by IPOS showed that 59% of Iranians now believed that no election fraud had taken place during the 2009 elections, and that Qasem Soleimani, the commander of Iran’s Quds Forces in Syria, enjoyed a 38% popularity rating, with Foreign Minister and nuclear deal negotiator Javad Zarif polling at 76%. Fouad Oveisy is a PhD student in Critical Theory and Comparative Literature at the University of California, Irvine. His research is focused on the intersections between realpolitik, critical theory, and post-revolutionary strategy and literature. Behnam Amini is a PhD student at York University, Toronto in the program of Social and Political Thought. His research is mainly focused on democratic theory, the Kurdish question and decolonization. An Iranian Classic: For the Continuation of the Dictatorship, Long Live Elections!